York Hospital is to launch a new park and ride bus service directly to the hospital in partnership with First York and made possible thanks to funding from York Teaching Hospital Charity. The new service will launch on Monday 29 April 2019 and will run every 20 minutes from Rawcliffe Bar Park and Ride from 6.00am until 8.10pm, Monday to Friday. Tickets will cost £3.20 for an adult return ticket, there will be reduced fares for NHS staff with valid ID. Individual car use and the congestion caused is a big contributor to air pollution in York and the hospital approached First York to help reduce the number of cars travelling daily to and from the hospital. For more information visit: www.firstgroup.com/york. The leaflet above details the medication that the surgery will not usually prescribe going forward. This is a national policy designed to use NHS resources more appropriately and not a practice decision. Bev has retired this week after almost ten years with the practice. She asked us not to make any announcement until after she had gone but we are sure you will join the team in wishing her all the best for the future. The government has an initiative to allow patients to see a GP outside of normal surgery hours for routine care. After careful consideration of transport links we have opted to be part of the York service offering these appointments. You may find that the reception team offer you an appointment at another site if it is convenient for you, if you are seen using this service you will be asked for your consent to share your data. Tadcaster Medical Centre will have a GP seeing patients for this service on a Saturday morning. These appointments have to be booked and there will be no service for walk in patients. 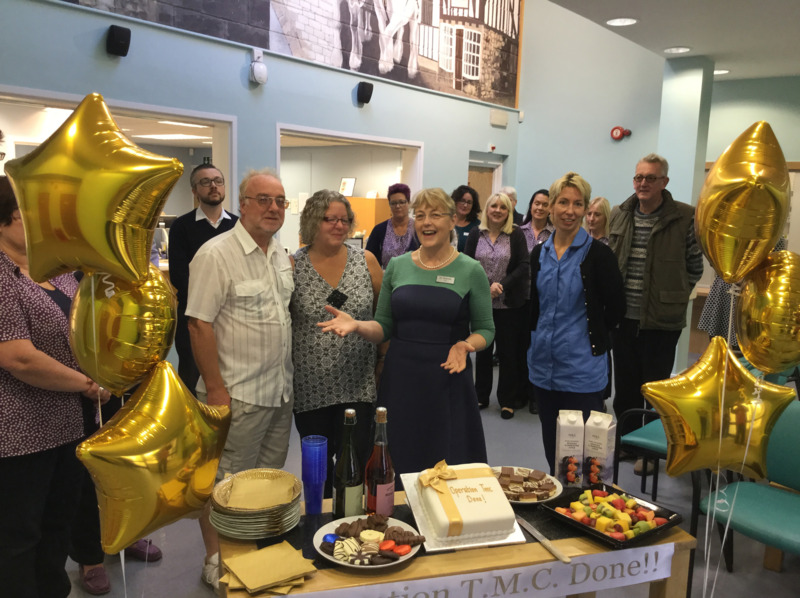 After 16 years at the Medical Centre Val has retired and is looking forward to spending more time with her grandchildren, we are sure that you will join the practice team in wishing her well. Why not have a look at this website to see all the benefits of taking part in a local parkrun. They take place on a Saturday at 9am and are 5km long, you can run, jog, walk or even just come along and cheer from the sidelines. If you want to take part it is free but you do need to register as a participant in advance and print off a barcode. http://www.parkrun.org.uk/ this website has details of all the runs (there are 570 locations) but we have put details of the closest ones below. If you have any photos of yourself taking part in a Parkrun we would love to see them. Why not join the new group walking in Tadcaster. This scheme is national and is designed to encourage people to start being active, the walks are short and over easy terrain. A group of local volunteers were trained earlier this year so you are in safe hands! You may see some familiar faces from the practice team too. Start point is the bus station at 10 am, the route is approximately two kilometers. This new service offers another way of contacting the practice with admin or clinical queries at a time that is convenient for you. Messages received by 11 a.m. Monday to Friday will receive a same day response but you can access the system 24 hours a day. Later this month we will be launching online consultations as an additional way of contacting the practice. There will be two options, one to get help from the practice and the other to get self help information from the NHS. Neither should be used in an emergency and the website will not replace 999 or 111. We hope that this will offer an easy way to get in touch with medication requests, fit note requests, medical queries or other questions at a time that suits you. The responses will not be immediate as the site will be available 24 hours a day for maximum patient convenience. Our reception team will still be available as usual and this service will not replace Patient Partner or Systmonline which will both continue to operate. The website will only accept queries from patients who are registered with the practice and you will be required to provide a contact number (or email if you prefer). The Alzheimers Society runs a clinic on the third Thursday of the month here at the practice. You can book a half hour appointment with a Dementia Support Worker via our reception team. The clinic is aimed at those patients who are worried about their memory, those with a dementia diagnosis and at the carers of both these groups. You do not need to be registered at the practice to use this service. There are also clinics at other practices across North Yorkshire or at the Alzheimers Society office if the Thursday session is not convenient. The link below takes you to their website where you can see all the support they can offer. Please let us know if your phone number changes. We have recently had problems contacting patients who needed urgent medical care because they had changed their number and not told the practice. The vast majority of our patients have something called a Summary Care Record (SCR) which allows healthcare professionals treating them elsewhere to see current medication and any allergies we have recorded. The next step is to add more information to make the SCR more useful for clinicians who are using it and add things like any operations you may have had in the past, immunisations or decisions you have made about your care. None of this will be made available without your consent. If you would like to upgrade your SCR please complete the form below and return it to reception. On May 25th new rules come into force regarding the data we hold about you as your GP surgery. Our Fair Processing Notice is on our New Patients page. You can download it from this website or request a paper copy from reception. As a result we will be asking for ID when medication is collected from Dispensary or letters and other paperwork are collected from reception. Please bear with us and our team in this period of adjustment. Please do not worry about this change. The NHS sometimes uses anonymised data for research and planning. If you would rather your data was not included then you can opt out via a new website. This opt out applies where you have accessed health and social care in England, if you have previously accessed health services in Wales or Scotland the opt out will not apply. Your confidential data will still be used to offer you care, any opt out will not change this. If you are happy to have your data used for research and planning you don't need to do anything at all. 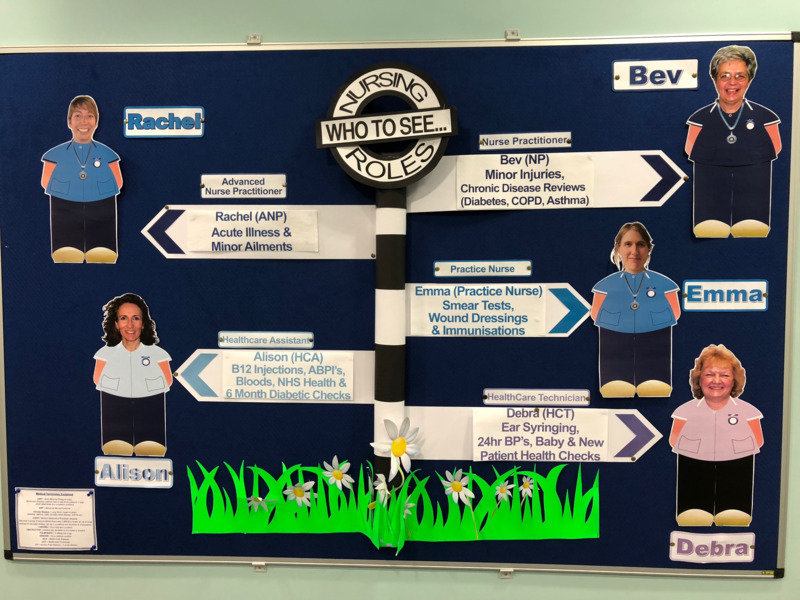 The NHS is changing and so are the staff, along with all GP Practices nationally we are working with the reception team to signpost patients to the most appropriate healthcare professional who may not always be a GP. Our nurses have been very busy training over the past year - why not see if one of them can help you next time you come to the surgery? How does the NHS Work? Ever wondered how the NHS works in 2017, the link below takes you to a short film explaining it. Be warned it is a lot more complicated than you think! Have you been referred to hospital? NHS England, the BMA and NAPP (The Association of Patient Participation) have worked together to produce this leaflet that explains the process and gives you a checklist to take to your appointment. Please check their website for the latest newsletter. You may have heard on the news that GPs have been asked to do some work with patients who have been identified as severely frail. The leaflet below details why and what sort of questions you may be asked. As we head into a new school year we have been asked by our local Medical Committee to remind patients that it is NOT necessary to have over the counter medication (such as calpol) on prescription if you want it to be used at school or nursery. The Statutory Framework for the Early Years Foundation Stage – effective April 2017 identifies current national standards for day care and childminding from birth to five, whereby non-prescription medication can be administered if the parent has given prior written consent for the administration of any medication. Prescription medicines must not be administered unless they have been prescribed for a child by a doctor, dentist, nurse or pharmacist (medicines containing aspirin should only be given if prescribed by a doctor). Medicine (both prescription and non-prescription) must only be administered to a child where written permission for that particular medicine has been obtained from the child’s parent and/or carer. Providers must keep a written record each time a medicine is administered to a child, and inform the child’s parents and/or carers on the same day, or as soon as reasonably practicable. There is a global shortage of hepatitis B vaccine and until further notice GP practices will not be able to order vaccine. You may be able to source one via a private provider if they have stock but all new vaccine in the UK is going only to NHS Trusts who will use stocks for patients who have had exposure or who are at most risk. The link above contains advice on minimising the risk of catching blood borne diseases (including hepatitis b) whilst travelling. We apologise for any inconvenience but this is beyond our control. The new childhood immunisation containing hepatitis B is not impacted by this. The Department of Health recommends that all 70 year olds book to have a Shingles vaccine with the nurse. If you are currently 70 we will be writing to you this week. In addition all 78 or 79 year olds and people over 70 but born after 1st September 1942 can also have the vaccine as part of a catch up group. WE CANNOT GIVE THE VACCINE TO ANYONE WHO IS 80 OR OLDER OR WHO FALLS OUTSIDE THE GROUPS ABOVE. Please book to see Nurse Emma or Nurse Rachel for your vaccine. There is a global shortage of Hepatitis A vaccine. Current information suggests that we will not have access to NHS vaccine stock for at least a month unless treating patients who have had contact with a patient who has Hep A and are therefore at very high risk. If you are travelling please check updated guidance below as the countries where Hepatitis A vaccine is recommended has been reduced. We are told that private providers may have access to stock of the vaccine, the price for this will vary by clinic. There is a new Musculoskeletal (MSK) Service being run by York Hospital. Their website is full of advice for patients about both long and short term conditions. If you are aged over 17 and are registered at the practice you can refer yourself to the physiotherapy team using the online form. We have been made aware of this very useful bulletin by the local Healthy Child team. There are lots of activities local to Tadcaster advertised. The bulletin is at the bottom of the page to download. At the request of our Patient Participation Group we have updated the flowchart that explains when GP appointments are released on a daily basis. Click on the link in the Appointments section or pop into the practice to pick up a print out. If you would like to contact the group they have their own email address voyccg.ppgtadcaster@nhs.net. BUILDING WORK IS NOW COMPLETE! Dr Reeves welcomed members of the Patient Participation Group to a celebration on October 19th. We hope you like the new look building. We understand that some patients may find it more convenient for us to email them rather than sending letters in the post. If you would like us to update your record to send letters this way please complete the form below and return it to us. The form makes clear the risks inherent in sending personal information about you via email outside of the secure NHS network. Please read this letter from the partners at the practice regarding changes to the process when you are booking your appointments. All our patients are registered with us as a practice and can see any GP on the team here. By March 2016 the government has decided that every patient also has to have a named GP linked to their record who will have responsibility for the coordination of care for that patient. If you would like to know who your named GP is please ask at reception or in your next consultation. Having a named GP should not change how you use the practice and does NOT prevent you from seeing any GP at the practice as you currently do. For this reason we will not be routinely changing the named GP assigned to your record. This practice plans to offer the facility for patients to view online, export or print detailed coded information held in their own records before 31st March 2016 (a small group of patients are currently testing the software). If you would like access to this information please complete the attached file and bring it to the Medical Centre with photographic identification. Parents are able to have proxy access to this level of detail for their children up to the age of eleven. The NHS in North Yorkshire has decided that children aged 5-19 will receive their routine vaccinations at school. Patients at school in the City of York can have their immunisations at the practice as normal, please let the reception team know that your child is at school in York when you call to book your appointment with the nurse. The vaccine campaigns for 2016 are as follows, you will be contacted by letter via your child's school when the nurses are coming in to vaccinate. HPV will be offered in year 8 as in the past. If your child has not had their pre school boosters these canbe done at the practice even after their 5th birthday. IF YOUR CHILD NEEDS THEIR TEENAGE BOOSTER INJECTIONS PLEASE CONTACT THE SCHOOL NURSING TEAM ON 01845 521680 WHO WILL ARRANGE IT FOR YOU IF YOU HAVE MISSED THE SESSION AT HIGH SCHOOL.